This economy package contains three 360 ml bottles of SoloCare AQUA multi-purpose solution. It is suitable for sensitive eyes and effectively cleans and stores all types of soft contact lenses. Its unique Hydrolock technology keeps lenses moist and comfortable. Solocare AQUA is a multi-purpose solution intended for cleaning, disinfecting, rinsing, moisturising and storaging of all types of soft contact lenses. It effectively cleans lenses without rubbing them. SoloCare Aqua solution uses effective, well-tolerated cleaning ingredients, and is therefore suitable for sensitive eyes. This package contains three 360 ml bottles of solution and three antibacterial contact lens cases. 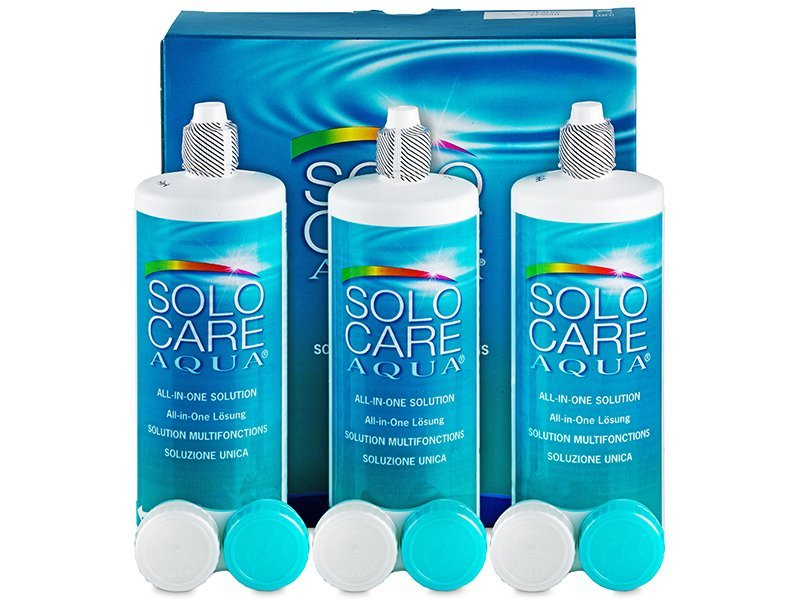 Solocare AQUA is also offered in packs of 90 ml, 360 ml and 2 x 360 ml.